Route de Malmedy 7, 4900 Spa-Francorchamps, Belgica. Romantik Hotel Le Val d’Amblève is situated in the green heart of the beautiful Ardennes countryside, on the peripheries of the small town of Stavelot. It is an hostellery which is distinguished from the others by its cordial reception, its traditional but light cooking and its personal attention. 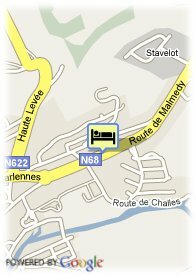 Le Val d’Amblève has sixteen rooms with bath/toilet or rain shower/toilet, flat screen/DVD, telephone, hairdryer, etc. They are all restyled or new, with warm colours and all with a panoramic view on Stavelot or the 'hills'. The restaurant with its “jardin d’hiver”, “the Festival” (breakfast room), the lounges and the garden with its large terrace translate the atmosphere of well-being which planes above this house, where relaxation, gastronomy and culture are very important to form a particularly harmonious cocktail. We have several arrangements (1 day or more) for the weekends but also for during the week. Relaxation and business. The hotel and restaurant are closed from ± 20th December till ± 20th January. Dogs admitted in certain rooms with a supplement of 10,- EURO per dog/per night. Large parking on the site of the hotel. Large terrace. Bosque, Proximidad a la estación, Parque, Zona de museos, Proximidad a la autopista, Vistas panorámicas. Menos de 5 dias y mas que 3 dia(s) antes de la llegada: 1 noche debe ser pagada. Menos de 3 dias y mas que 1 dia(s) antes de la llegada: 2 noches deben ser pagada. Cama de bebé: supplemento de 30.00 € por cama adicional.